Sooner or later I'm gonna run out of title names for the hat posts. Here is Josie's new pajama shirt. She has yet to get a pair of pajama pants. On the front is a button up shirt that looks cozy and a little vintage, and on the other side is a heart, making it appear like a sweater. I started a hat a couple days ago and got too lazy to finish it, but today I did. It's like this hat, but bubblier. In the photos of the one I just sent you a link to, you can't really see that it's a bubbly hat, but it is. I like both. This next one is - unintentionally - square-ish, and looks a little like something a sailor would wear. I put a bow - that I somehow ended up with after a failed project I already forgot about - on it to make it cuter. And she's also wearing sleeves, made with yellow fabric, with a white inside lining. I sewed a top that has ribbon for straps and inside lining. 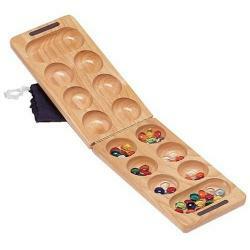 I played Mancala with Kiki, and she won so hard, and got about twice as much beads (points in the game) as I did. The pics above are of her waiting to go. She didn't want ponytails, but I insisted so that her hair didn't get messy in the bag I brought her in. Peaches and my whole family went to a BBQ place where we got tons of great vegan food! Peaches was able to try the fruit and ice cream! She wasn't interested in the bread pudding. Peaches was served a grape that was 4 times larger than her eye! Peaches and I loved going there! Thanks for reading! Planning to crochet a dress, I stopped at shirt length, due to A: Laziness & B: It looked really cute as a shirt, and I have more dresses than shirts anyway. I made a coat yesterday, and finished the buttons and I sized it today! This morning, I put Josie in the ruffled white skirt I have, and thought "I don't have any shirts that I want to go with her outfit," so I made one. It's just two circles that I put together and overlapped, and I put a button on the side to connect them, and two strings at the top that tie in the back. I really like it, and it's kinda a new style. I think the hat also is kinda a new style, because it's cute and... I don't know... hip? Pop? In? Hope you liked this post! I GOTTA RUN! I crocheted another bunny hat, and did this one with blue and brown yarn. I love it and so does Kiki and the other Blythes! Even though Peaches didn't get any candy from going door to door, the Halloween Witch still gave her a dress!!! It's purple (Peaches's favorite color) and it has designs that kinda look like butterflies (what Peaches dressed up as). It's grand! P.S. Happy World Vegan Day!